Pakistanis who send jokes about President Asif Zardari by text message, email or blog risk being arrested and given a 14-year prison sentence. The country's interior minister, Rehman Malik, announced the Federal Investigation Agency (FIA) had been asked to trace electronically transmitted jokes that slander the political leadership of the country under the new Cyber Crimes Act. Malik, said the move would punish the authors of ill motivated and concocted stories through emails and text messages against the civilian leadership. The step, which was described by human rights groups as draconian and authoritarian, came after government was particularly riled by a barrage of caustic jokes being sent to the presidency's official email. 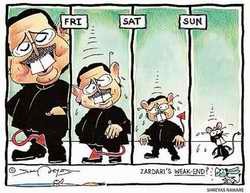 Zardari has proved to be prickly about what others say of him since he was elected as president by the national parliament a year ago. Most of the criticism stems from his government's inability to address problems such as severe power outages and inflation, and his inability to shake off old allegations of corruption. The ban has become the focus of intense television debate in Pakistan, as Zardari's aides have attempted to justify the move using every argument ranging from counter-terrorism concerns to saying that women parliamentarians had received abusive messages. Pakistan's Minister of Interior, Rehman Malik, recently announced a 14 year prison sentence for anyone found propagating SMS and emails ridiculing or making fun of the present Pakistani leadership and its elected government officials. The statement issued by the Ministry of Interior actually referenced the Cyber Crime Act of 2009 which apparently may subject the violators to at least 14 years behind bars. 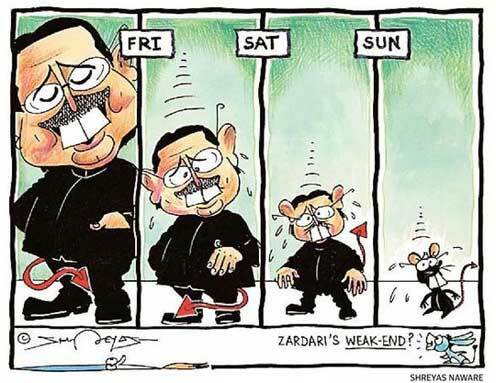 Since the start of this newly elected government, the local leadership, namely the President of Pakistan Asif Zardari and Minister of Interior Rehman Malik have been at the receiving end of some very hard hitting gutt wrenching jokes, which in turn a propagated across SMS's and emails like wildfire not only in Pakistan but also across the world. Seeing their local leadership at the base of many hard hitting jokes, the government decided to take such critical offenders to task. Here lies a very important problem, it is surprising to note that the Cyber Crime Act does even not exist, the Pakistan Electronic Crimes Ordinance of 2007 ironically had no mention of any crime related to SMS's let alone sending and even categorizing humorous SMS's which may tarnish the image of the an unspecified local leadership, the maximum prison sentence in that bill was set at a maximum of 7-years [10-years if it involved a minor]. The statements made by Ministry of Interior were challenged, and the only official response that has been received till now that the correct draft has not yet been released to the public. It only seems that the politically motivated statement was more or less geared towards scaring the general public into submission and hopefully stopping political rivals from ridiculing them.